Everything in this thread is aimed for optimal. There are lots of things you can do that are not listed here. I'm well aware that some people love the look of 11" wheels and have made it fit, and claim no decrease in handling, ride quality, etc. Congrats. This thread will focus on the best possible setups from a functional perspective, and you can vary it however you want from there. Last edited by Obioban; Mon, May-10-2010 at 02:45:02 PM. This first post is not about fitment. Just because I list a setup as matched DOES NOT MEAN IT WILL FIT ON YOUR WHEELS OR IN YOUR FENDERS. I'm going to attempt to lay down some basics for tire sizing on this car. This thread is going to be geared mostly towards street use, where DSC interference matters. Okay, ground rule: You want the front and rear tire to have, as close as possible, the same rolling diameter. DSC works by comparing the rotational speeds of the various tires. If your rear tires have a smaller rolling diameter than the car expects, and the fronts are the same, the DSC will think at all times that you are having slight wheel spin (as the rears are rotating faster than the fronts). If the system is predisposed to thinking that you have slight spin, then it's much more prone to intervening-- it'll take much less to set off the DSC. That makes for unfun driving dynamics. The numbers before the slash (/) indicates the section width of the tire; the widest point from sidewall-to-sidewall. The larger this number, the wider the tire. This number is the wide of the tire in millimeters. In this example, the tire has a 215-millimeter section width. The next number trailing the slash (/) indicates the height of the tire in a percentage of the section width. In our example, the number is 70, which means the tire height is 70% of the section width, which is 215 millimeters. The height of this tire would be 150.5 millimeters. The lower the number is, the lower the profile of the tire. The next letter is reveals the construction of the tire. The most common is “R” such as found in our example. The “R” designation states the tire is of radial construction. Other construction types are rarer for modern passenger car use, and may include “D” for bias ply construction and “B” for belted tires. The number following the construction code is the size of the wheel in inches. The example tire would be designed to fit a 16-inch wheel. Tire sizes on modern vehicles typically start at 13-inches and go up to 18-inches, but aftermarket and special package wheels can be 22-inches or even larger. Take away: If you go with a wider tire, you need to run a smaller profile percentage to have the sidewall (and circumference with it) not become larger. Notice how the circumference is nearly identical in stock spec. The closer you keep to that ratio, the less DSC interference you'll have. The numbers are close enough that for ease of use I just stick to 1:1. Okay, so let's expand upon this. Most of us don't want to be running the stock setup as 225 is pretty small and understeery. So, what options does that leave us? Well, two categories: staggered (30mm) or square. One final note: For the purposes of DSC, all that matters is that the front and rear have nearly the same circumference. That said, as you get further away from the stock 81.7", the speedo will read faster and faster at the same speed (and the speedo comes about 5% fast from the factory, so you're just making a bad situation worse). Last edited by Obioban; Thu, May-13-2010 at 01:31:12 AM. If your goal is getting a stretched look, look elsewhere. That makes everything about the car worse, and I won't have any part in it. 10.5"+: There's no reason to run anything larger than a 10" on this car. It looks dumb to people who know anything about performance, and is detrimental to handling. Vary from these and you begin to bow the tire's contact patch. Oversize the tires and you make the tire bow out, undersize the tire and you make it bow in. Either way results in a decreased contact patch vs a properly sized wheel with the same tire. Go far off those sizes and you start to overheat the tires under normal driving. First, let's start out with a definition of what wheel offsets are, so people can follow. On the M3, and all modern BMWs for that matter, the offsets are negative. Therefore, the smaller the offset, the more aggressive (or pushed out) the wheels are. Moreover, adding a spacers will decrease the effective offset. For example, adding a 10mm spacer to a 35mm offset wheel will make the offset 25mm. 2. Assuming the "face" of the wheel is relatively flat, you're adding a moment arm through which the wheel will torque on the hub (bearings). For example, if I have a wheel that is an ET22, the wheel face will be located pretty close to the center of the wheel, and the compression forces of the car acting through the hub are in the same vertical plane as the wheel face. The same is true in the case of the ET45 wheel, but when I add a 20mm spacer, I've now added a torque to the face of the hub in addition to the simple shear force I had before. With the spacer, the force is vectored down in the plane of the hub, which is transmitted to the wheel through the spacer. The wheel is directing its force on the spacer vectored upward, so the spacer moves the planes apart by the 20mm, which creates a torque on the wheel and the hub from the upward force of the wheel and the downward force of the car. Maybe this wasn't that clear, but it is true. Spacers create more stress, add weight, and create more possible sources of vibration. Whenever possible, buy wheels in the correct size/offset and skip the spacers. If you do run spacers, and sometimes they are necessary (I need them for my snow wheels to clear the BBK, for example, Whenever possible use hubcentric spacers. They're much safer, and stress the car much less than non hubcentric. It's also an extremely good idea to get a stud kit. They make a stronger construct, they're less likely to loosen themselves, and they make mounting/dismounting tires much easier. Okay, so, now that you know what they are, how do you find the right one for the car? Well, originally with a measuring tape, shims, spacers, etc… but we're past all of that at this point. 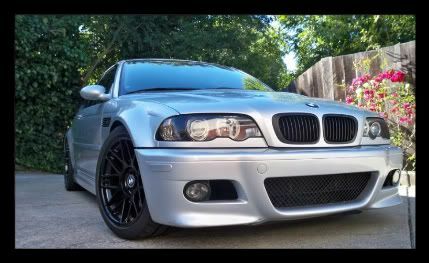 What works well on the e46 M3 is pretty well establish at this point. So, here's how I'm going to do this: I'm going to list the best offset for a given size wheel (best meaning biggest tire fitting. You bling guys can make your own thread about stance, flush, etc), and the tire size you can fit on that. From there, if you wan to run a more aggressive wheel, you just decrease the tire size from there (aka, for every 5mm more aggressive you go, reduce one tire width (tire widths go in increments of 10mm, half goes on the inside, half on the outside, so every 10mm decrease in width brings it in 5mm on the outside)). And I'm just going to focus on wider wheels with bigger tires, as smaller wheels/tires fit fine over a wide range of offsets. Assume stock fenders, no rolling, no fender liner removal. 9": ET38. All tires 265 and smaller will fit, some 275s will fit. 9.5": ET35. All tires 265/35/18 and smilers will fit. All 275s will fit with some extra camber in the front. SOME 285s will fit-- this will vary from one tire model to the next. For the track, it's beneficial to run a square setup so you can rotate tires (extends tire life) and dial out understeer (matching front and rear tire sizes). The Optimal setup for this is 18 x 9.5 ET35, with a 10mm hubcentric spacer in the rear. This setup allows you to easily run 265 tires square, 275 square with some alignment tweaking, and 285 square if you work at it. Take away: Clearly the offsets listed above are not the only offsets. What they are is the ideal offsets. Generally speaking, for every 5mm of variance of the above offsets, you need to decrease the width of the tire by 10mm. NOTE WELL: There are lots of factors involved with tire fitment. Alignment, the specific fenders on your car, the model of tire you go with, etc. The above is generally true for the e46 M3, but there are exceptions. If you want to be guaranteed to have no fitment issues, don't push the tire sizes. The smaller you stay, the less issues you can run into! Last edited by Obioban; Tue, Sep-28-2010 at 11:53:29 PM. (this is just to get you started. Once you get comfortable, you can tweak the pressures to bias the car towards over or understeer. To get started, set the tires pressures to the pressure recommended by the manufacturer. If you're running street tires, set it to the BMW recommended pressures on the inner door frame. Get a tire marker pen and draw a line from the center of the sidewall to the contact patch. Go out and do a couple laps, building up till your at your full speed. Pull into the pits. The amount that the paint has worn off the tire shows you how much tire rollover you have going on. Some is good, too much is bad. On dedicated track tires, there's little triangle that indicate the exact spot where rollover should stop. If you're rolling over beyond the tip of the arrow, add some pressure to the tire. If you're not making it to the tip of the arrow, let some air out of the tires. If you're on street tires, it's a little trickier. Generally speaking you want to make sure you are staying in the tread blocks, not driving on the sideways. Some tires have blocks that are designed to go out more than others-- PS2s, for example, are designed to have some rollover to get you into the maximum grip blocks. The above technique should not be used for street tires, as there's much more going on there-- tires that aren't up to temp, varying loads, pot holes, etc. Street use requires more pressure than track use to be safe. Last edited by Obioban; Tue, May-11-2010 at 03:08:46 AM. Question: If smaller rear makes DSC think you always have slight rear slip, then wouldn't a slightly smaller front make DSC think opposite so you can have slightly more rear slip before it kicks in? I like having DSC on for street driving, but would like it to be just a touch less intrusive. I wonder if 235/40/18 + 255/40/18 would give me what I want without too much negative effects. A 225/45/18 and a 285/35/18 at the same tire pressure (PSI) have the SAME contact patch! You read that correctly. Given two tires at the same pressure, the contact patch is the same. The benefit to wider tires is that you can run them at a lower pressure without overworking them. So… once you've done all your crazy tire upsizing, if you run the same pressure you were running before, you haven't gained any grip! Crazy, right? I don't know absolutely, but I'm inclined to say it wouldn't work. The DSC will still think you're slipping a little bit in some way, and be more prone to cutting in... probably. I'd also like DSC to cut in less, but I think the odds are against this working. All times are GMT. The time now is 10:18:24 PM.